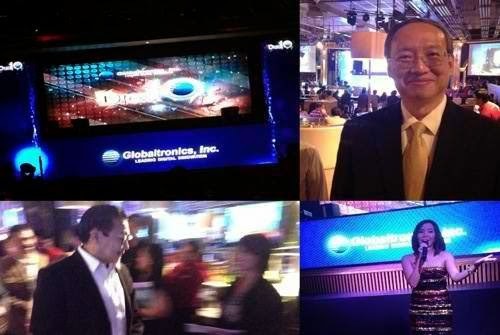 Last night, I was invited sa bonggang event ng Globaltronics -- the country's leading supplier of LED billboards nationwide -- at talaga namang proud na proud ang lahat ng nandoon with the success of the company. Bilang isa tayo (Star Cinema) sa mga partner ng kompanya sa pagpapalawig ng kanilang business, I was there to support and witness the celebration. 'Magnificent!'. That's how Mr. William Guido, chief executive officer of the Globaltronics, Inc., described the journey of the company for 10 years and counting. "I'm so proud that digital innovation in the country has gone this far through Globaltronics," Mr. Guido added. Present din sa nasabing ang Governor ng Laguna na si ER Ejercito at ang Kapamilya nating si Marion Aunor who serenaded the guests with her lovely song numbers. Iniimbitahan din ng Globaltronics ang lahat to join their Digital Asia Expo on May 29 and 30 sa SMX Convention Center, MOA Complex. Visit lang sa www.digitalasiaexpo.com for details. Kaya naman guysss, kung may mga businesses kayo na like niyong ipa-place sa mga billboards, mag-LED billboards na kayo from Globaltronics! ;) For inquiries and bookings, just contact 02-721-2878 or 02-643-3887.